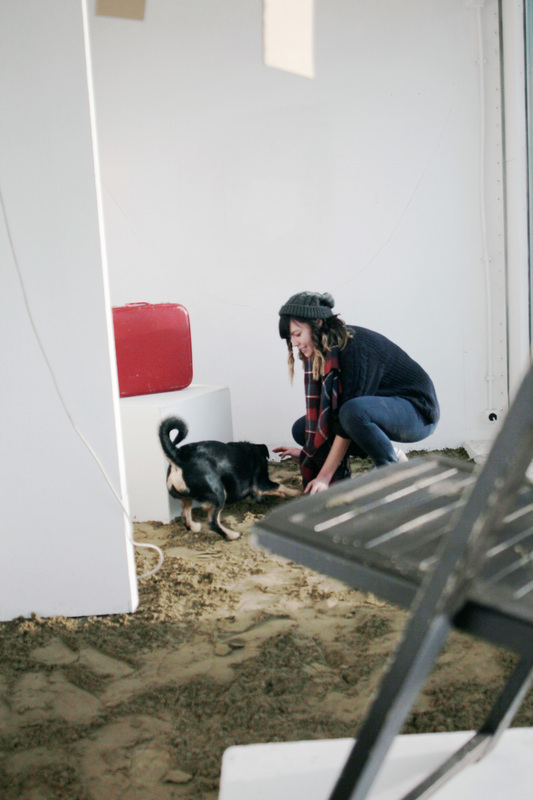 Nina Segal was the artist in resident at NDSM Treehouse for the month following Amber Imrie-Situnayake. She investigated the same terrain and transformed the same shipping container galleries but in a very different way. Nina Segal is a playwright and theatre-maker, creating work around themes of human cultural and social evolution and explorations of the future trajectory of humanity. Her current work includes two pieces strongly connected to questions of human instinct and Utopian ideals. Nina Segal and her twitter. What drew you to the NDSM residency? Why did you choose to apply there? I was drawn to the location, the people and the ethos. I wasn't explicitly looking for anything like NDSM when I first stumbled across it, but as soon as I found it, I knew it was what I needed for my practice at this time. I was looking for a place to focus on writing for a period of time and the relative isolation of NDSM, combined with the self-led nature of the residency, was exactly what I hoped for. I know I had a very rigorous month at NDSM, being that my work is so time-consuming, what was your process like? I actually felt like it was the perfect amount of time for my process - also as I ended up staying for two months, that took a little pressure off. There was enough time to focus on the residency show as well as my other projects and to still have time to explore the city. My process had two very definite halves - the first was a lot of sitting and thinking and working at a computer and the second was a whirlwind of panicked activity interspersed with periods of will-the-paint-dry-in-time fear. Definitely within that second half I often felt there was no way I would complete the project in time for opening, but as a whole the process has been much calmer than those few days! Tell me about how NDSM influenced your process and/or subject? I've been heavily influence by the landscape of NDSM - the texture of the world here figures strongly in Dear Johannes, I Still Have One Suitcase Left In Berlin, the work I created during the residency. The contrasts between the industrial and the human, between isolation and collaboration, between stone and sand - these all had an impact on my work and state of mind during the residency. Tell me about your installation show? What was your thoughts behind the work? Dear Johannes was a sound installation, set within a physically textured environment that reflected the influence of the NDSM environment. 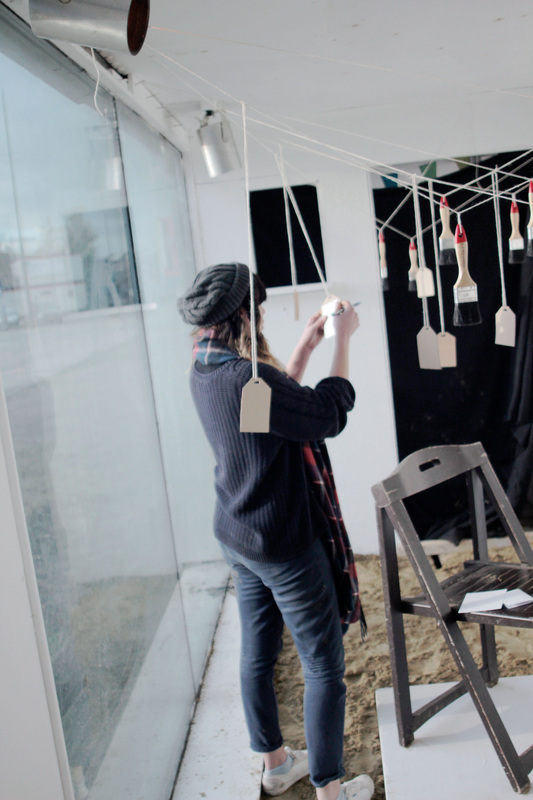 As a theatre artist, the experience of working within a gallery was new for me - so I spent quite a long time thinking about how to make the space 'live' without necessarily having performers, whilst being able to forefront myself as a writer. The answer I found was to create a piece of recorded text that invited the audience to engage in a one-on-one experience with a narrator who was both present and absent. The creation of a physically immersive environment heightened the level of the audience's engagement and the sense of stepping into a separate world. This feeling of communication across distance (in this case by merging the physical absence of the speaker with the intimate nature of a voice in your ear) was very much at the heart of the piece itself. Dear Johannes was inspired by a wall I saw in a corner of Malaysia whilst visiting family over a decade ago. The wall was painted with a letter, a love letter, in thick black lettering - Amber, I will send you this photo. 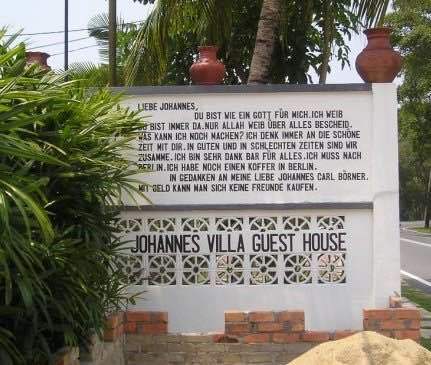 It was a public declaration of a private love, on a wall, in Malaysia, in German. I've always been fascinated by communication and miscommunication, presence and absence and the worth of words - and this wall seemed to encapsulate those questions and ideas. One line in particular struck me - 'I still have one suitcase left in Berlin'. A message across geographic and emotional distance - either the best or the worst way of making contact with someone. I took a photograph of the wall and the photo and the memory stayed with me for all that time. I knew I wanted to explore it, and my fascination with it, in a work, and that work became Dear Johannes. "I KNOW THAT I FUCKED UP THAT TIME"
The work is a collage of sound and sand and typography, and an investigation of how physical exertion relates to depth of meaning - whether an act of exertion can ever (or, in fact, might always) mean more than words. 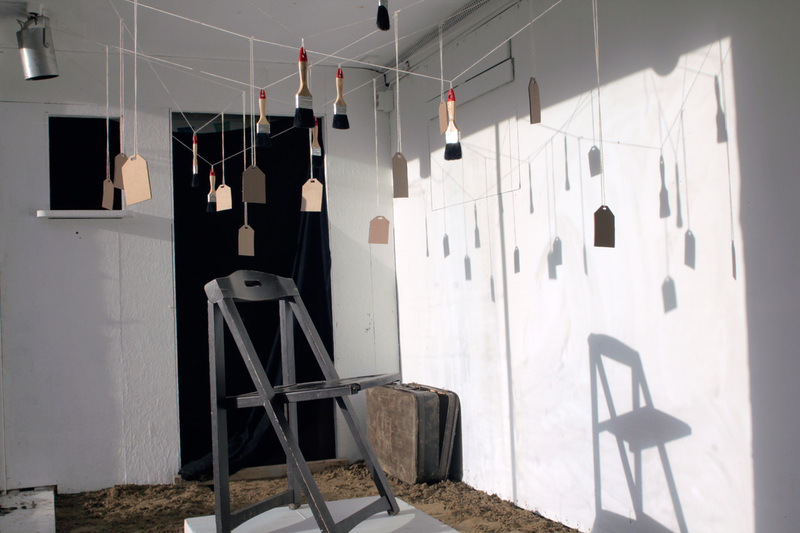 The project itself consisted of four elements: aural (audio) , textual (the written luggage tags), physical (the audience's journey through the sand, negotiating and engaging with the hanging objects) and imagined (the act of imagining and empathizing with the acts of exertion described and the meaning imbued in them). All four combined for the same purpose - to ask the audience to consider how physically exertion relates to meaning.
" I'LL BE HOME SOON "
- an act which, through replicating it as part of the project, I can tell you is time-consuming and physically difficult; a far cry from tapping out a message on a keyboard and pressing send. The presence of written text within the installation (on the luggage tags) presented both an example and a counterpoint to this - in pairing messages and meaning with descriptions of often tongue-in-cheek physical acts (e.g. "I will try harder I promise / Followed by a pack of hungry animals"), we both highlight and subvert the idea of exertion and meaning, not least in the lack of physically exertion inherent in the description of the imagined acts. Overall, the project became a physical manifestation of my own inability to 'mean what I say' - a collage of serious intention and ultimate insincerity. I realized that although I could match the physical exertion of the original wall-painter, I could not match the assumed sincerity of their words - which itself became a sincere admission. How did this experience help you grow or develop as an artist? How was the physical installation process? Fun and tiring - my boyfriend thought I was losing my mind when I first started moving all the sand indoors. Both getting the sand in and out was very satisfying - a real sense of getting something from the land and then returning it from where it came. It was also a useful counterpoint to the theoretical questions I was dealing with - a good way of finding focus and avoiding getting knotted into questions of sincerity/insincerity. Where is your favorite spot on NDSM-Werf? The camper, in the early morning, when the sun is about to start shining and the propane heater is doing its job. Biking around Amsterdam was my favorite activity while at NDSM, What was yours? Finding spots to drink coffee or beer and really settle down to work - then walking back to the camper feeling happy with the day.
" YOU DESERVED IT MORE THAN I DID "
"I TRIED TO CALL YOU SO MANY TIMES"
Tell me about how it was living in the Camper with your fiancee and dog? Quite a squeeze, but nowhere near as bad as expected! We had to make an effort to be tidy, but on the whole it was very comfy and we managed to cook some delicious meals on that tiny stove. So I’ve heard you’re staying an extra month! That’s so awesome, I’m envious, tell me about how that came about and what you’re planning to do with the time? A lucky coincidence - there was no artist planned for December and both Ty and I had ongoing projects, so we were happy to stay. It took us about two and a half weeks to really feel like we'd figured out how to get the best out of NDSM, so we were keen to get even more out of experience. I'm working on a new play called In The Night Time (Before The Sun Rises) and hoping to have a final draft finished by Christmas. It's a two-hander about a young couple trying to keep a child from crying, as the world slowly ends outside their window. It's not a play about apocalypse (and it's definitely arguable that the world in the play isn't ending any more than the real one currently is) - it's more about feeling like you don't understand the world and not having to face that lack of understanding until you try to explain it to a child.